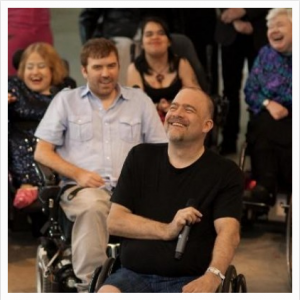 Realwheels, in partnership with Kickstart Disability Arts and Culture worked to address the limited number of theatre venues that are truly and fully accessible for artists, backstage workers, and patrons with disabilities. During Phase 1 of our Cultural Infrastructure Project (2016 – 2017), we partnered with Social Planning and Research Council of BC (SPARC BC) to conduct a Needs Assessment of Accessible Performance Spaces in the City of Vancouver, which included a review of leading practices and feedback from the broader community. We asked: What is currently working well? What are the gaps and challenges in regards to accessible theatre venues? We created an accessibility audit checklist, and our multi-disability audit team undertook a thorough audit of one theatre venue. We invite you to read the final report, which encapsulates our findings and includes the accessibility audit checklist, along with the details of our audit of the Firehall Arts Centre. From left to right: Catherine Wilson of BMO Theatre, James Sanders, Cathy Browne, Mark Ehman of DA Architects, Lindsey Adams of Realwheels, Marco Chiaramonte of WIDHH, Rena Cohen of Realwheels, Yuri Arajs of Kickstart, Amy Amantea, Sarah Lapp. Thank you to our audit team!! In October 2018, we completed the final phase of this Cultural Infrastructure Project. 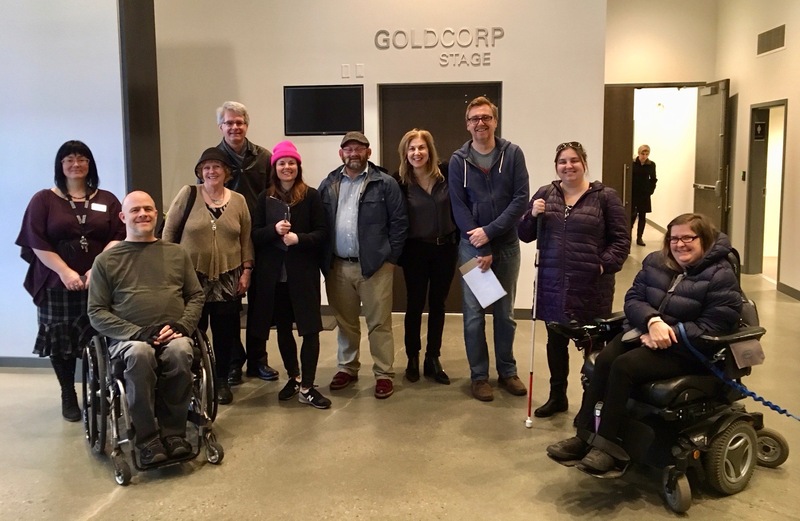 Working with DA Architects + Planners and DWD Theatre Design and Consulting, we conducted an Accessibility Audit of three existing theatres in the City of Vancouver (Pacific Theatre, BMO Theatre, and the Roundhouse Community Arts & Recreation Centre). A detailed architectural solution was then designed for the Roundhouse (selected due to it being the most used venue in the city by people who live with disabilities and because it has the building infrastructure to make significant improvements), which will support next-stage planning of actual accessibility enhancements. The following report summarizes key findings and accessibility solutions for the Roundhouse Community Arts & Recreation Centre, based on the audit that took place on December 4th, 2017. In addition, a refined audit checklist was created, which you can download below. We invite you to use it, share it and support our efforts to reduce barriers to cultural accessibility. We wish to thank the many individuals who participated in this project.